To Combat e-Scooter ‘Threat,’ Should There Be Speed Limits in Bike Lanes? DOT won't comment, but you'll soon be hearing more on this topic. Life in the bike lane is not supposed to be life in the fast lane. 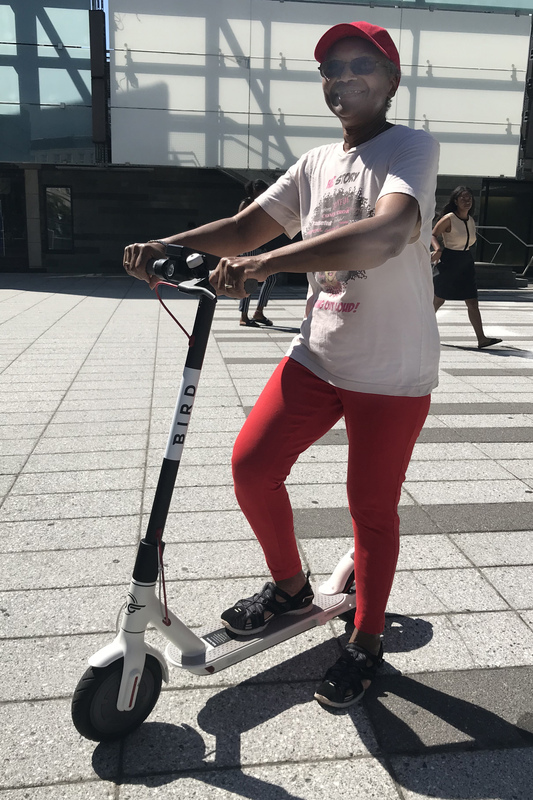 Department of Transportation Commissioner Polly Trottenberg is already looking ahead to the legalization of e-scooters, telling the New York Cycle Club earlier this week that her agency is already analyzing how e-scooters will operate in the city’s ever-growing bike infrastructure network. Which could mean that e-scooters, some of which can hit 20 mph, will be flying past regular bicyclists, who putter along at 10-13 miles per hour. That prompted lawyer Steve Vaccaro, whose practice often represents cyclists who have been injured, to demand that the maximum speed of an e-scooter should be 15 miles per hour. Vaccaro presented his plan in an epic Twitter stream on Wednesday morning, but later told Streetsblog that the “moto-scooters” (he calls them that so that they won’t be confused with a kid’s toy) should be certified by local bike shops or a city inspection service as not being able to exceed 15 miles per hour, a speed limit that he says currently works in Los Angeles. >@pollytrott said she envisions bike share expanding to all of upper Manhattan "soon". She sees a role for dockless at the edges but thinks the docked system is superior where economically feasible and believes the Lyft acquisition should enhance Citibike operations. 10/n @pollytrott pointed out strongest rationale for allowing moto-scooters in bike infrastructure: safety of grouping transpo modes homogenously by speed/maneuverability characteristics. Moto-scooters are too fast for sidewalk, too slow/non-nimble for vehicular lanes. The issue arises as Council Members Ydanis Rodriguez and Rafael Espinal are drafting a bill to legalize e-scooters, which are too fast for sidewalks and too slow for the car lanes of roadways. Their presence in bike lanes could make them natural allies of cyclists — indeed, an exec with the scooter company Lime told me earlier this summer that scooters will help create a larger constituency for protected bike lanes — but conflicts are inevitable, Vaccaro said. Makers of both Bird and Lime scooters said their devices don’t exceed 15 miles per hour, so a speed limit would not be a tough sell with an industry that’s lobbying like crazy to get into the New York market. But many scooters do go faster than 15 mph, and Vaccaro anticipates frenzied competition on the mean streets. The city is not outright opposed to motorized shared-mobility options. DOT is aware of the regulatory options and challenges around scooters, but for now, we need clarity from the state. Any changes must balance technical and transportation issues, and especially address the safety concerns we have about these scooters and their impacts on the city streets we work to improve each day through Vision Zero. This is an exciting and challenging time in urban transportation with many innovative technologies hitting our streets, but that also brings regulatory and safety concerns we must address. So, is that it? You want to give the NYPD to engage in even more egregious enforcement actions against cyclists, so they have a reason to retain you and challenge their tickets? Maybe get a class action going? I don’t really believe you’re that cynical. Nor am I really skeptical about your cycling cred. Still, it’s hard to understand how anyone with any familiarity with NYC politics and NYPD responses can think this won’t come back to bite cyclists, and hard. For every Ydanis, there’s at least two pols who would be all too eager to impose a flat speed limit on cyclists across the city. And I have to wonder if you’re on their side. Sure, there might be no reason to quibble with a 15 mph limit in the Avenue lanes, which see too much traffic – cycling and otherwise – for faster speeds to be safe. But 15 mph over the bridges or on any of a host of other protected and unprotected bike lanes is not especially realistic or – in some cases – safe. I typically cruise at a comfortable 17 mph northbound on Shore Boulevard’s bike lane along Astoria Park, at least when it’s not busy. I book it down Jackson Height’s bike lane on 34th Ave at 20 mph+, so that I can merge seamlessly into traffic when the lane is blocked, dooring risk seems high, or traffic conditions counsel more assertive riding to avoid right hooks. When the QB bridge is clear enough, I’ll climb at 15 mph+ and then descend well in excess of that, getting over its 1.25-mile or so span in probably half the time as most other riders, so that I don’t feel the need to steal back that time by running reds on either side. The list can go on and on. There are times to be safe, but times also to be aggressive. You legitimately don’t seem to believe that cyclists need to have speed in their repertoire, so you’re not focused on the genuine risk that an e-scooter speed-throttle mandate will morph into something far more expansive. But I think any realistic appraisal of our politics has to think that risk is genuine, and any experienced cyclist has to acknowledge that the risk is material. Keep in mind even the Netherlands has cycling superhighways in between major population centers. They just don’t call them that. No matter what the land use patterns are, there is going to be a need for longer trips, even if most trips are very short. That’s where cycling superhighways come in. Just as a regular highway can still be useful for a shorter trip of one or two exits, cycling superhighways can speed up short 2 mile bike trips, while also making 10 or 20 or 50 mile bike trips viable. E-bikes and/or velomobiles make such trips even more practical if you have bicycle superhighways where you can book along at high speeds for most of the trip. While both can sometimes be very relevant to a specific region or country, there shouldn’t be too much emphasis placed on sprawl or population density. Otherwise, the US can just give up trying to do anything in regards to building infrastructure. I would never expect there to be a nice bicycle path connecting San Diego to Boston; how many people would even try to make such a journey anyway? But that doesn’t mean that any of the American cities (and their attached suburbs) can’t have nice infrastructure like you have in the Netherlands. The US should start within cities and then expand outwards. Although the rate of cycling is higher in the Netherlands than anywhere else, it can certainly still be higher than what it is. There are still too many car trips. But there are endless possible reasons as to why some Dutch people might choose to drive for a particular trip. Most often, distance is the reason. Most Dutch people are not biking from Utrecht to Rotterdam or from the latter to the Hague or Amsterdam. Those distances are too much for most Dutch people. So they either combine the bike with the train/bus, or drive. Many high school kids live in other towns and villages and often have to bike long distances, some up to 10 miles or more one way. And more and more, it’s getting harder to find a job with your partner in the same city, so many of my colleagues end up picking the most decent/reasonable city that’s located between them. Unfortunately, this sitll turns out to be well more than 15-20 miles away for many of them, so they either use the train or drive to work. E-bikes go the same speed as Freds. Did you download and read the study? If not, this is just cherry-picking: finding one study that supports what you want to believe, without paying attention to the details. Oh yes, the details… although this study is “Europe wide,” it is heavily tilted toward compact, flat cities. E-bikes give the most exercise (especially cheap e-bikes) when you’re going full speed. Riding at lower speeds through congested stop-and-go traffic doesn’t give much exercise; but that’s the likely traffic for the riders in this study, as compared to where I live. I depend on my e-bike in NYC and burbs — a definitely NON-compact, NON-flat city. When I was in Chicago, I was amazed at how EASY it is to bike around. Many people don’t even bother with multi-gear bikes. Why would you need it in Chicago? And yet in large, hilly cities, e-bikes can become essential; either you get significant exercise on an e-bike, or you drive. > Although the sample of e-bikers was small, riding an e-bike was asso- ciated with higher BMI. This finding could complement a previous study that found that older adults with a higher BMI were more likely to be an e-bike-user (Van Cauwenberg et al., in press). This would indicate the presence of self-selection. In the longitudinal analysis, we hy- pothesize that more frequent use of an e-bike leads to a higher BMI through less regular biking. However, it is unlikely that all of the weight gain was the result of reduced physical activity, as e-biking still requires moderate to vigorous levels of physical activity (Berntsen et al., 2017; Langford et al., 2017). Again, the authors mention that their MAIN goal in this study was to determine health impacts of manual biking vs. driving vs. public transport, all of which had decent sample size. They admit they don’t have much sample size for e-bikes, motorcycles, etc. 1. E-bikes cannot magically make your commute effortless AND give you exercise. They do one or the other, but not both. If your commute is beyond the limits of the human body, then e-bikes can be a big help. But if your commute is not too hilly and not too long, then, then e-bikes may be more trouble than they’re worth. 2. Given the opportunity, many people will use the lowest-effort means possible to get where they are going. But even with many people doing that on e-bikes, this study seems to show Americans might still get some health benefit by switching from car to e-bike. Not to mention all the benefits that accrue to everyone around them…. 3. If you care about getting exercise, then you need to be pro-active making sure that whatever biking arrangement you have actually provides you exercise. Monitor heart rates, total travel time, exhaustion levels, etc. 1. Nobody is realistically suggesting e-bikes go >20mph on American bikeways. 2. You average 285w at 25mph. Most e-bikes will average more, due to the upright body position. 3. Air resistance is the biggest thing slowing you down on a bike, and it goes as the SQUARE of your speed. To first approximation, maintaining 26mph on the flat requires 4x as much energy as maintaining 13mph. So… if you can do 13mph at 0% assist, then to first approximation, the same amount of effort will do 26mph at 75% assist (assuming you have an e-bike that has been illegally modified to go over 20mph). The state and issues surrounding bike infrastructure are SO different in the Netherlands vs. USA. I don’t see how much relevance your posts have to us here. While the idea that the collision rate is at a minimum when the speed difference is small makes sense for bikes, I would take the numbers you quote from the Solomon curve with a huge grain of salt, considering they were based on data for driving cars on rural highways. I would have to disagree that ebikes are a comparable threat to automobiles. I ride bicycles here in NYC multiple times a week, and have never felt as though I would be seriously injured or killed in an ebike collision. but I am usually the fastest rider on the path/street. Your first statement is completely understandable given your second statement. Your perspective as “the fastest rider on the path/street” is very different from the 90% of people who are riding much slower. I ride a fair amount around NYC (both Brooklyn & Manhattan) and around The Netherlands and other places in Europe. When I ride on the street in both places most cars give a fair distance when they pass. Most e-bikes OTOH give inches when they pass. Being hit by a car is more likely to result in being killed or seriously injured but being hit by someone riding an e-bike is more likely to happen. NYC (and the U.S.) doesn’t yet have many e-bikes, but they are becoming ubiquitous in Europe. In The Netherlands I experience many more close calls by e-bike riders passing me within inches and then cutting back sharply in front of me than I do close passes by cars. High powered e-bikes are making the formerly very safe and comfortable Dutch bikeways feel much less safe and comfortable and they are beginning to discourage people from riding normal bicycles. I’m a fan of e-bikes but like any tool there is a place for different versions. If people want to ride fast and higher powered e-bikes on the roads then I’m 100% for that. And I’m a huge fan of people with genuine disabilities having as much power as they need to keep riding. But I do not want to see bikeways become as unpleasant and unsafe feeling as the motor roads. Bikeways in The Netherlands, Denmark, Sweden and elsewhere work so well because everyone using them is traveling in about the same speed range (9-13 MPH on flat, slower up hills) and are quite considerate of each other. There are some people going much faster but they generally do so in a safe and considerate manner. As with just about anything there are exceptions and there are jerks of all types but they are not frequent. The problem with higher power e-bikes is that they consistently go much faster than others but most importantly is that they are inconsiderate of other users. They have a ‘get out of my way’ attitude. This is not unlike people driving cars. They tend to feel like they have all this power and so they are more important than others. Someone who is elderly or disabled and needs a bit of motor power to be able to ride at all rarely has such an attitude (but yes, there are exceptions). Not everyone who uses a throttle as a control method for manipulating speed is a menace. You can equally be a menace on a pedal bicycle, or even on foot. I completely agree. But experience in The Netherlands and elsewhere is that people with throttles are much more likely to be a menace than others. Of regular bicycle riders I’d guess about 1 in 500 is a menace. Of e-bike riders other than elderly or disabled I’d guess about 1 in 4 or 1 in 10. If there was some way to magically allow someone who will not be a menace to have whatever power they want and limit the power for those who will be a menace I’d be all for it. But I don’t think there’s any way to do that. In those cases, as you state, some people are perhaps traveling too fast for the bicycle infrastructure. It has nothing to do with the type of control. Actually, it very much has to do with the control. People with throttles (e-bike or gas scooter) tend to be the biggest menace, pedal assist e-bikes ridden by people who are not elderly or have disabilities are next and people on regular bikes the least. As I mentioned above, there seems to be a mentality that comes with how much motor power someone has. The greater the ratio of motor power to human power the greater the “I’m more important so get out of my way” attitude there seems to be. That said, in both Groningen and Utrecht for instance I’ve seen many people riding gas powered scooters (snorfiets) who were also quite considerate of others and not a problem (except for the noise and pollution). It’s seemingly not fair to penalize them for the problems that others cause. But as a group they are a very considerable problem and one that is causing people to not ride bicycles and drive their cars instead. So while perhaps ‘not fair’, there is no other viable option to preserve the safety and comfort of the bikeways. And the ‘not fair’ part is not a big issue because it’s only a convenience — 99% of the people riding powered scooters (electric or gas) can just as well ride a regular bicycle and the 1% who are disabled and cannot will be able to get special permission to ride a powered bicycle or scooter. Or, for those who really do not want to put forth the effort to ride a regular bicycle they can ride a higher powered e-bike or scooter on the roads. This is like saying that you can’t ride 2 miles to the grocery store because Nashville is 250 miles from Atlanta. As to overall national density you are correct, we are not nearly as dense. But where most or our trips take place, in metro areas, the difference is not so great. And interestingly the gap is closing as most U.S. cities are becoming more dense as younger generations are choosing to move in to the urban cores and more recently the 1st ring suburbs. As I mentioned above, 50% of our trips are less than 3 miles. Just because The Netherlands is more dense doesn’t mean that we can’t ride bicycles for most of these short trips. BTW, I agree that we need much better land use patterns but overwhelmingly our #1 problem is infrastructure. Fear of being killed by someone driving a car or simply how unpleasant riding on roads with motor traffic can be are the number one reasons that people in the U.S. do not ride. #2 is likely bicycles. Our bike shops sell bikes that are geared towards recreational toys rather than efficient, convenient, reliable transportation. #3 is likely mindshare. Getting people to think that they can ride a bicycle 1000′ to the store instead of driving their car. It is relevant, if you accept Commissioner Trottenberg;’s premise for creating a regulatory framework to incorporate motorized devices into bicycle infrastructure: there needs to be some degree of homogeneous grouping by speed. Of the limit is 25 in the roadway, and the motorized devices can 20 or more, why shouldn’t they be in the roadway with the rest of the motorized conveyances moving at that approximate speed? In that case, isn’t putting the 20 MPH motorized conveyances in the bike lane just grabbing the car-free space bicyclists worked so hard to win and giving it back to motorized users? This is not a discussion about speed limits, notwithstanding the title of the post. No one in this discussion is in favor of managing the speed of traffic in the bike lanes/paths through the mechanism of posted speed limits and ticketing. I travel faster than 20 MPH regularly during my daily commute. I only do it when it is safe. The question is whether we should trust casual users of moto-scooters and motorized bicycles to use good judgment about when it is safe to go that fast. Reasonable minds can differ on that question, but I say, no. I might be convinced to allow professional delivery workers to have motorized bikes capable of doing 20 MPH. They are not casual users. But there would have to be training and regulation. Simon, you’re leaping to so many conclusions here. I’m not proposing speed limits. None of my cycling advocacy is driven by a profit motive. I have fought long, hard and repeatedly against NYPD for persecuting cyclists (and other crash victims) and nothing I do is intended, designed or likely to invite more persecution. I’m just having a conversation about the details of regulation of motorized vehicles in the bike lanes. This is an increasing problem on the Williamsburg Bridge bike path, where mopeds and even motorcycles can be seen just about every day. Combine this with the unbelievable presence of pedestrians (who, absurdly, are ignoring their own path on the other side of the bridge! ), and on some evenings the Williamsburg Bridge bike path has a lot of potential for danger. Yes, and that is why so few people walk or ride bicycles in the U.S.? Why someone walking or riding a bicycle in the U.S. is about 9 times as likely to be killed as in The Netherlands? Why we have the highest rates of obesity, overweight and chronic health problems of all developed countries? Why should we not try to catch up to other developed countries? Correct on #2. When I enter the numbers on a bicycle power calculator ( http://www.kreuzotter.de/english/espeed.htm ) I assume an e-bike is similar to a mountain bike. That gives 610 watts to maintain 26 mph (but only 95 watts to go 13 mph). This is 6.42x more power. 610 watts will get you much more speed on a road bike. On #3, yes, the aero drag portion of bicycle resistance in pounds increases as the square of speed but the power needed increases as the cube of speed. Tire drag is more or less constant with speed. However, when you’re going twice as fast you’re pushing that force through twice the distance every second. Hence the power to overcome tire drag is proportional to speed. Overall, the power needed to go faster on a bike increases with a factor somewhere between the square and cube of the speed. The problem here is that the 25 mph speed limit ends up being a defacto 35 mph speed limit given the way cameras and police enforce speed limits. Most traffic on arterials moves at 30 to 45 mph. I’m not seeing that anything short of a major street redesign will get people to consistently drive at 20 or 25 mph on major arterials. What this means in practice is that 20 mph is too slow for the roadway. If you really feel these things are too fast for bike lanes, then I suggest we change the regulatory framework so e-bikes capable of at least 30 mph, not 20 mph, are treated legally the same as regular bikes (i.e. no license, registration, or helmet requirements). This will allow them to take general traffic lanes most of the time. Remember the federal e-bike laws (750 watts, 20 mph) are only a minimum. States are free to make laws which treat vehicles with higher speed and/or power the same as regular bikes. While we’re at it, also clarify the law on bike lanes so that people who want to go faster than is safe in a bike on a regular bike can ride outside without fear of getting a ticket. Unfortunately, it’s the only hard data we have to go on. As far as I know, nobody has done similar research for bikes on bikeways. I’d rather we use hard data, even if the application here is a slight stretch, than to base laws on subjective feelings. I’m really surprised by how specious this argument is. You need to take your advocate’s cap off and put a logician’s hat on. Car-free space with 20 mph e-scooters is still car-free space, just as much as it is car-free space when cyclists can and do travel speeds in excess of 15 mph. We don’t have bike lanes because there is some need to separate “motorized” from “non-motorized traffic,” and relative speed is only part of the rationale. The bulk of the reason why we have segregated infrastructure has to do with risk of harm. If speed is why you think regulation of e-scooters in bike lanes is justified, then it has to follow that you would also support citywide speed limits on cycling infrastructure. You make a good point, that Steve’s proposed “solution” to the e-scooter “menace” threatens to make them unsafely slow in the vast majority of situations in which their users operate them. Naturally, any one sensitive to this aspect of the issue may infer, then, that the best way to regulate e-scooter speed is only when they’re in cycling infrastructure. So – speed limits applicable only to cycling infrastructure. As others have said repeatedly, this is more a behavior problem than a problem with the specific vehicles people are using (although of course I agree gas-powered mopeds and motorcycles don’t belong on bike paths). It’s similar to the issues with the delivery cyclists. They happen to be on e-bikes but their riding habits would be just as abhorrent if they were on regular bikes (and there were in fact legions of complaints about them before they got e-bikes). Implicit in what you wrote is that now you’re advocating for lower speeds for e-bikes, not just e-scooters. For starters, the federal regulations state that anything with a top speed of 20 mph or less, and a motor power of 750 watts or less, is legally a bicycle. States can make less restrictive laws than this but not more restrictive. So legally, NYC or NYS would conflict federal law trying to cap the speed of e-bikes under 20 mph. The second problem is you’re now on the slippery slope Simon has alluded to several times. First it was 15 mph for e-scooters, now it’s limiting e-bikes to less than 20 mph. Don’t think the way NYC legislators have a penchant for heavy-handed regulation that this couldn’t eventually morph into a 15 mph speed limit in bike lanes. Let’s just strongly encourage rental scooter companies to limit their scooters to 15 mph and be done with it. It seems most or all will voluntarily do that anyway for liability reasons. As I’ve mentioned several times, the biggest problem both here in the US and in Europe is that legal e-bikes (i.e. those which are treated the same as regular bikes, meaning no license, helmet, or registration) are typically too slow to share roadway space with cars. I know there are provisions in European law for speed pedalecs which can go 45 km/h but typically they require a helmet, license, or registration, perhaps all three. In the interests of getting people out of cars, how about we legally treat any electric two-wheeled vehicle weighing under about 75 pounds, with a top speed of maybe 50 km/h or less, as a bicycle with regards to registration, insurance, and helmets? We can still prohibit these faster e-bikes from bikeways but at least if we do that they have the speed to keep up with car traffic. We can also still allow e-bikes with very limited power and speed to continue to use bikeways. If these are allowed without registration (which in Europe comes with appropriate colored plates indicating what class they are) then there should be some requirement for identification such as a permanent painted color patch prominently displayed on the rear fender (like where a license plate would have been). Yes, that would work just fine. You’ll know instantly whether or not there’s a vehicle in the bikeway which doesn’t belong there. Yes, but in most cases Americans must make much longer journeys per day than 2 miles to the grocery. It could be 5 miles to work in the AM, 3 miles to the cafe closer to home after, 1 mile to the grocery, and then 3 miles back home. In metropolitan areas in Europe, especially the Netherlands, those distances are smaller because their metropolitan areas are much more compact on average. And even then, the majority of bike utilization is within cities. And unfortunately, although there has been revitalization in certain cities and certain inner ring suburbs, the trend is still suburban growth. Growth of places where automobiles are the dominant form of transportation, and where existing infrastructure and land use make this hard to change. You wouldn’t need the massive infrastructure investment needed to retrofit suburbs if they were more compact and embraced mixed use communities. Even if you created good infrastructure, bicycle utilization would still be subsidiary to automobiles in those places where most people live. Most of America was designed for the car, and as a result, the car is the dominant form of transportation. My primary argument is that the electric bicycle is a tool that can help close the gap somewhere, and handicapping its capabilities is not the right policy. The Dutch on average have much better access to reliable/efficient mass transportation that is within reasonable cycling distance. And the vast majority of people live in a combined metropolitan area more similar to northern New Jersey than the average American suburb. The difference between where the average American lives, especially regarding land use and infrastructure is stark. My main point is that ebikes have an advantage when it comes to adapting to existing infrastructure in the USA, and should not be handicapped to only providing somewhat of a boost, or mandatory pedal based acceleration control. eBikes can be the key to disrupting the automobile based land development/policy as more users choose that option. Many of these people would not use a pedal bike as a mode of transportation. It seems like we are actually in agreement that what Americans need are more viable alternatives of getting around, whether it be safe infrastructure for cycling, or better transit. Yes, the public transit in larger Dutch towns and cities are much better than in the States. But the same is not true of the smaller towns and villages that don’t have a train station. These often only have infrequent buses, many of which might be on hourly headways and cease pretty early in the day. This is where you see the most driving proportionately. The Dutch government could have also questioned the need to connect all the towns and cities here with bicycle-friendly infrastructure. No one can argue that the usage is much lower between cities than within cities. Had they planned that way, they would be in serious trouble today, as people are increasingly not working or going to school in the same place as they live. But I merely wanted to caution the over-generalization of the situation, especially when it comes to density or size of a place. While the internet has been an incredible platform that has allowed Americans to learn a lot about how differently things are done in places like the Netherlands or Denmark, I still see so many misconceptions and generalizations being put out all over these kinds of blogs. It hasn’t happened on this thread, but the most common one is when people refer to “Europe” as if it was one homogeneous country. Especially when it comes to transportation and civil engineering, it’s necessary to individually look at all the countries, even within Northern Europe, to avoid losing all the little nuances. That’s two ad hominem attacks in a row. Conversation’s over. You also don’t know what an “ad hominem” is, apparently. Will scooters help cities push out Uber and Lyft? Scott Kubly thinks so. New rules would limit speeds on sidewalks to six miles per hour and 15 miles per hour on the street, with penalties ranging from a $20 ticket to a misdemeanor punishable by up to 30 days in jail or a $1,000 fine.